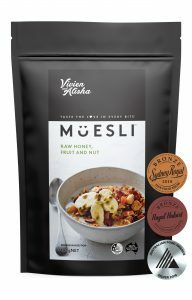 Family has always been our greatest source of inspiration – and we definitely had my fitness fanatic gym junkie cousins in mind when we created this Raw Honey and Almond Muesli. 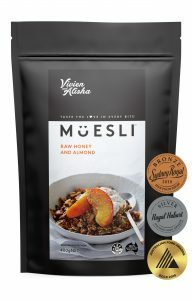 It’s a delicious, gnarly mouthful of almonds, pumpkin, sunflower and chia seeds, oven baked in pure raw Australian honey. Guaranteed to put extra bounce into your burpees! Mum’s always had a weakness for banana bread. This helps to satisfy her cravings, while keeping things wholesome. 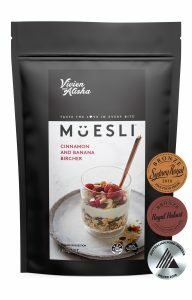 It’s a classic Bircher style muesli, based on super-healthy rolled oats, with delicious chewy banana pieces and a sprinkling of fragrant cinnamon. Mmm… smells exactly like baking day in our kitchen. I love my Dad, and my Dad loves fruit and nuts. I reckon if they made fruit and nut pizza he’d be up for it. So this one has my Dad written all over it: Rolled oats and tasty toasted coconut flakes, with chunky macadamia and almond pieces, juicy apricot, cranberry and sultanas – all oven baked in pure golden honey. A real lip-smacker. Mum created this blend especially for me, based on one of my favourite childhood treats. 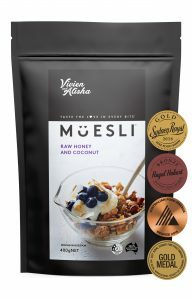 It combines the golden goodness of raw honey with a mouth-watering blend of oats, almonds, pumpkin and sunflower seeds – and lashings of toasty coconut. Yum – Honey Joys for grown ups!